There are so many exciting things you can do with candle displays. 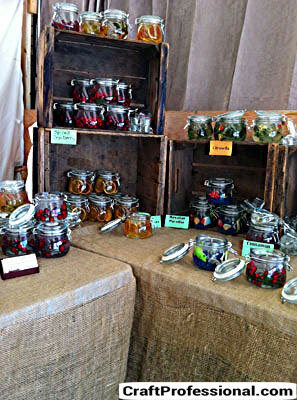 You can use a huge range of furniture, containers, risers and packaging to create any type of feel for your booth. 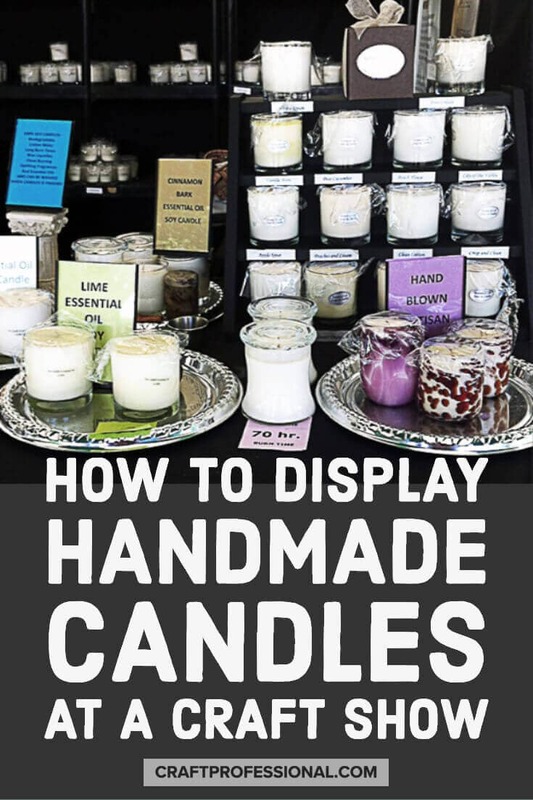 As with soap displays, in a candle booth, your furniture, containers, decor and packaging will be extremely important for setting the tone because the items you are selling are probably quite small and not easily seen from a distance. 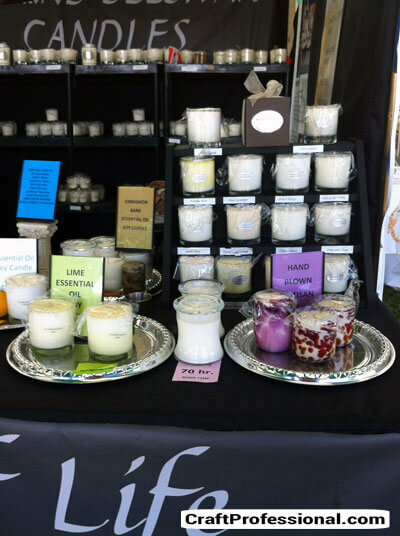 Particularly if you are selling scented candles, the customer needs to get up close to your booth to fully experience your product, and a great display will help draw people in from a distance and then allow them to touch, smell and really experience your candles to entice them into making a purchase. The booths pictured below all do a great job of drawing people in and then giving them easy access to experience the product. 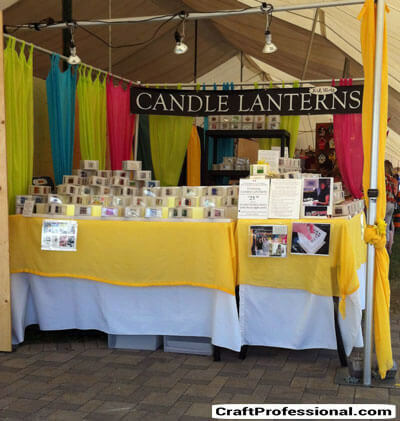 Bright colors make this candle booth fun and trendy. Great lighting helps, too! Notice how different all of the candle booths pictured on this page feel. One is elegant, a few are rustic, and one is bright and fun. If you look closely at the packaging of the candles in each booth, you'll see that the style of the packaging matches well with the style of each booth, which creates a cohesive look that doesn't confuse customers. These handmade candles are enormous! 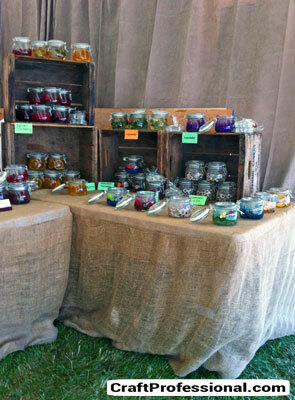 In both of the pictures above, the candles are neutral colored, so the candle makers have used color in their display items to make the booths pop. The booth on the left is decked out for Christmas, since this photo was taken at a Christmas craft show, but it would be easy to remove the garland and switch this booth out to fit other seasons also. The booth on the right has an entirely different look (even though the candles are similar) created by the luxurious blue and gold fabric. Although this craft artist sells regular sized candles, (they are around the corner, so I didn't get them in the picture) the huge candles are the first thing you see when you approach the booth, and they are so intriguing, you are compelled to enter the booth to get a better look. 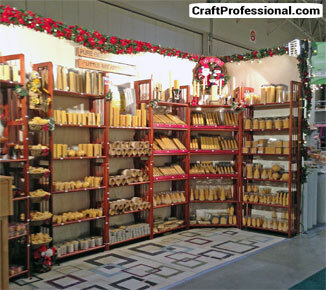 There are a lot of similarities between candle displays and handmade soap displays. The size of the items to be displayed is similar, and with both types of booths, you need to ensure customers can easily pick up, touch, smell and experience each item. 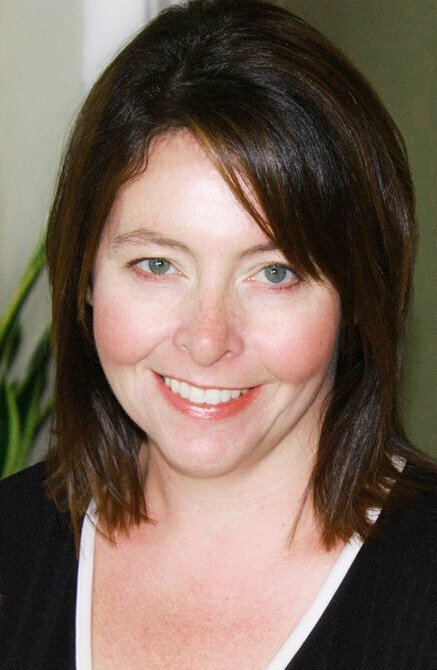 In both cases, you need to create a real sensory experience. 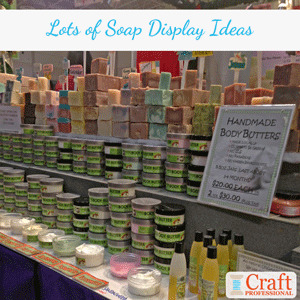 Once you've had a look at the pictures of candle displays, click over to the soap display photos for more ideas on how to create a great booth. 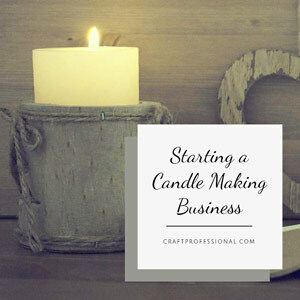 Tips for starting your candle making business. 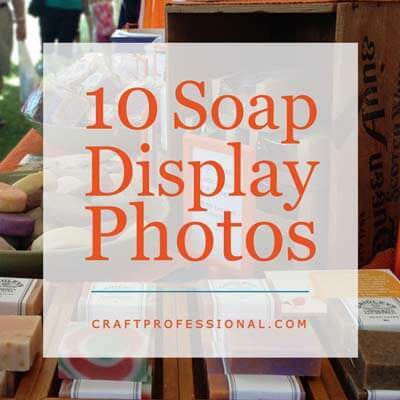 Soap displays have a lot in common with candle displays. Look for ideas that would work for your candle booth here. 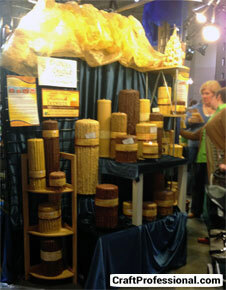 More soap display photos right here.